It's overwhelming how much support and love has poured in on here, on Facebook, in email and in person. I feel truly blessed to be surrounded by such caring people. A lot of people said that it would take time to heal old wounds. And I totally agree that the natural progression is to take things slowly and let things flow. But on the other hand, it has been so long already. I think one of the things that has helped was the opportunity for us all to be together... for us to get to know one another as the people we have become. I really couldn't afford the trip down, but not to go... not to seize the opportunity, that would be something I would regret. So I went... not knowing what to expect. While we were together, we created memories to replace the ones that are threadbare and nearly forgotten. We talked and laughed and the new memories did much to fill the gaps and long stretches of time that we weren't connected. The "babies" have helped a lot as well. Max and Azalea are a new generation and are untouched by much of the baggage. Seeing them love so easily is refreshing. It is sweet to witness the sheer joy and pure excitement of having another family member. It's not the first time that the children have brought this family together. Before Azalea, we were all set on different paths. Dwayne was still missing, Sheila was in Thailand, Cynthia was in California, and I was in New York. Our parents remained in Florida. Our grandparents were still alive and living in Missouri. Talk about being far flung! We were scattered all over! I talked with my sisters and my parents rarely – I was more concerned with standing on my own and being independent. I was tired of all the fighting and sad faces back home and wanted to see who I was away from the shadow cast upon the family. I did talk with my grandparents often and would tell them stories of what it was like living in the City. They seemed both amused and disgusted by my descriptions. My heart was "blessed" several times over in the course of the conversations. Through them I also heard family news and kept tabs on everyone. When Azalea was born, things changed. Our family slowly began to knit together again. Sheila came back from Asia. My parents relished in their new role as grandparents and I became a frequent visitor of Asheville and my sisters became some of my best friends. It's strange how much things can change in an instant. Seeing her was like my heart grew ten sizes. I was so afraid of touching her when I first saw her. I didn't pick her up. I just stared at her in the cradle and she stared back. I was afraid that I might break her; she was so small and innocent. Azalea is the age now that I was when Dwayne left. When I look into her face, it is not sad. Her eyes are not red-rimmed and her cheeks are not tear-stained. What I see is endless possibility and the promise of bright days ahead... from here on out. I carefully constructed a post called, "The Geography of Living". In it, I compared life to different natural features like mountains, rivers and canyons. But when I read back over the words, it seemed too clever. It seemed too slick. It said a lot, but it didn't say exactly what I wanted it to say. So, I deleted it. What I didn't like was how sad and angry it made me sound. It made me sound ungrateful and as if I didn't really care... or rather, that I did care, but just about my bleeding heart and nothing else. It's true that I'm still processing and still in shock. I'm still getting used to the idea that Dwayne is back. (Even saying his name is a big step! For years, his name was taboo. If you said it, my mom would instantly start crying.) When I got back from my trip, I threw myself into my work to help take the edge off things. One might think it's weird to have to "cope" with a happy event... it's just that there are years of issues to deal with. But I will spare you... instead of waxing poetics, I will share this photo of us "kids". It's the first picture of all four of us in over two decades. When I was asked to participate in the Bohemian-Inspired Jewelry Blog Celebration, I was just thrilled with the opportunity to support my friends, Erin Siegel and Lorelei Eurto. They are some of the nicest people in the beading community and they have done a masterful job in putting together a beautiful book! 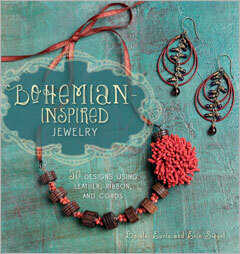 The pages of Bohemian-Inspired Jewelry are warm and inviting. They are also filled with helpful techniques and tips with working with fibers and cording. The projects enclosed are stylish and chic. 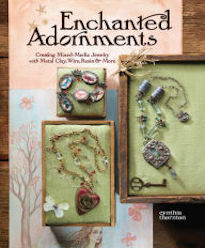 One of the things that I love about the book is the heavy usage of artisan beads and components. It gives the projects a handcrafted panache that really makes the pieces shine! It also supports the community-at-large and introduces some new talent that I wasn't previously aware of. I will definitely look into some of the great artists that they feature. 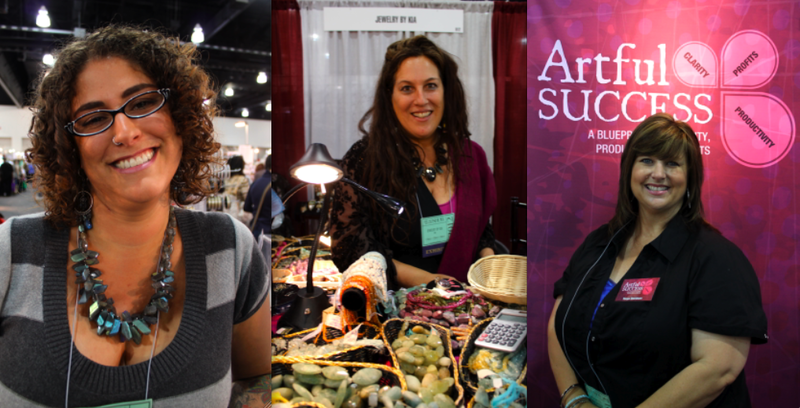 Lorelei and Erin do a great job with introducing fibers in jewelry-making. It opens up so many possibilities! The use of fibers can help facilitate making quick projects that look stunning. Depending on which fiber one selects, it can change the finished pieces dramatically. It's interesting to see how the contributors tackled their fiber-filled projects. The book features the work of Denise Yezbak Moore, Mary Jane Dodd, Michelle Mach, and Tracy Statler. Bohemian-Inspired Jewelry would be a valuable addition to anyone's library... from the beginner, to a long-time jewelry-maker looking for inspiration. I definitely recommend this book! The fun doesn't stop here! 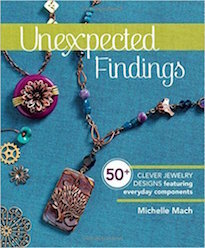 You can win TWO of the pieces of jewelry from the book. 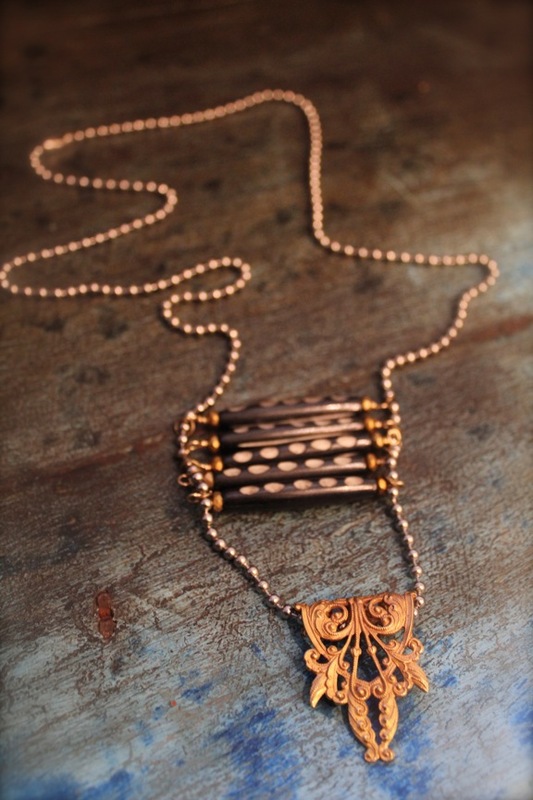 To find out how you can get ahold of these beautiful works of wearable art, CLICK HERE. They've got a fun Polyvore challenge. Cynthia and I got away from the booth for a few moments to walk around and we ran into Lorelei Eurto. 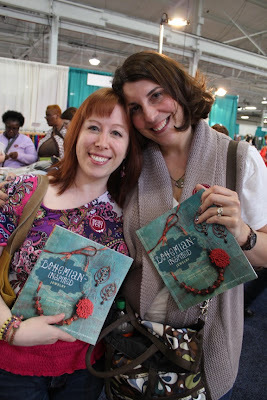 She and Erin came in today to do book signings at Melanie Brooks' booth. I love the rough, earthiness of Marianne Kasparian of MAKUstudio's raku-fired ceramic pieces. They have a primal feel to them and depending on the piece, there's a lustrous smokiness to them. Debi of Beads of Colour dropped in from Canada. She's always nice to see. One year she sent me a bottle of aromatherapy which I carry with me to every trade show now! It feels like only yesterday that I saw Sara Sally LaGrand in Hilliards, Pennsylvania at the first Soft Glass Invitational. It's always nice to see what she's working on... including this great piece she was presenting that had little faces in the pods. Aisha from Beaducation dropped by the booth with an ad from the program. In it is a picture of me watching Aisha perform a demo! It's always nice to see Jennie K. Stephens! She was working for Soft Flex Company and sporting a lovely labradorite necklace. It is also very nice to see Kia! 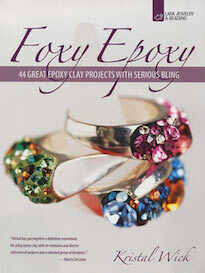 I love her rough cut gemstones and beautiful rings! 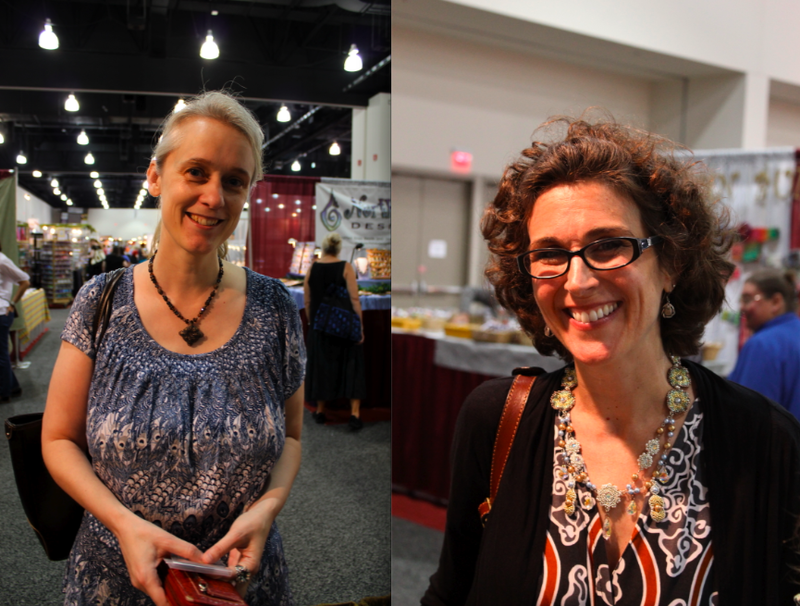 We also had the pleasure of running into Tonya Davidson of A Whole Lotta Whimsy. 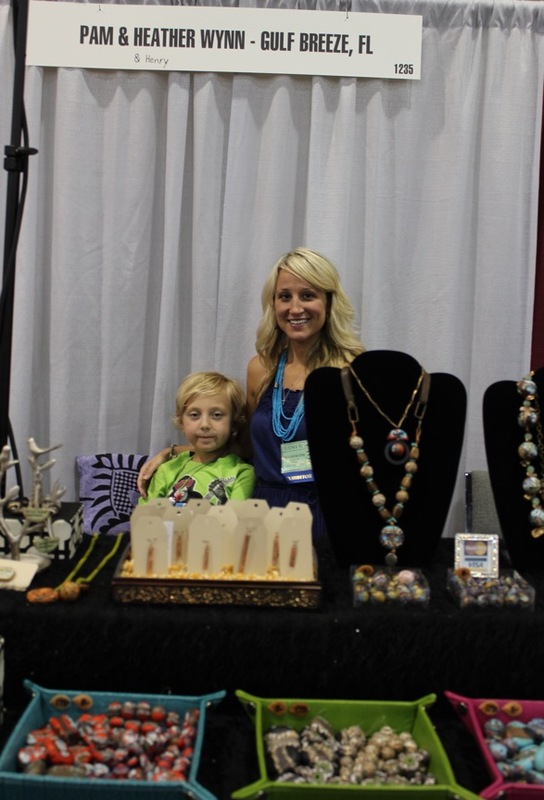 She didn't have her regular booth here this year, but had one focusing on her creative coach company, Artful Success. We quickly dropped by Joanne's booth and admired her glass beads. 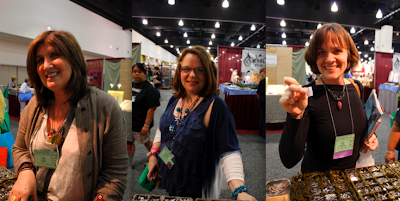 She creates some really organic and earthy beads. A rare treat was seeing Jamie Hogsett. It seems like we're always missing each other, but it was so nice to see her at the Soft Flex booth. She sounds really busy these days. 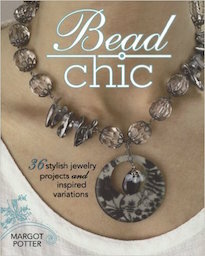 She just co-authored a book with Ask Sara and she works with several bead industry companies. 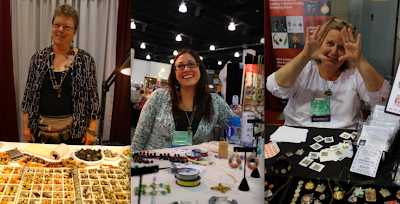 In Tucson, we heard some bad health news about Anne from Craft Fantastic. I was really worried about her and was so happy to see that she was doing better! It's good that she's on the mend and recovering nicely! I got a little package in the mail not too long ago from Carmi. She took one of my photographs and embedded it in resin. It was nice to finally meet her and see the new Envirotex resins. From my the usual stomping grounds, it was funny to see Diana in Milwaukee. I'm used to seeing her in Philadelphia. But it was a welcome surprise! Another friendly face that popped by the booth was Lori Anderson of the Bead Soup Blog Hops. She was there sporting her pink hair and smiling face! Innovative and always creating, these three ladies were doing wonders with glass in their booths! But they're all multi-talented. Not only does Bernadette Fuentes create some awesome lampwork beads, but she also makes soap! Who knew! Gail Croman Moore does just amazing things with the new cast pods and plant life, enamel, vintage sequins, and borosilicate glass. It's been awhile since I've seen Stephanie Sersich, but it was definitely a good thing! 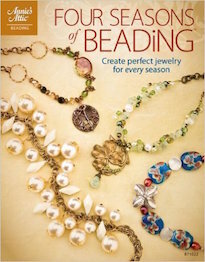 She had her colorful and charming beads, her book, and her beading boards. 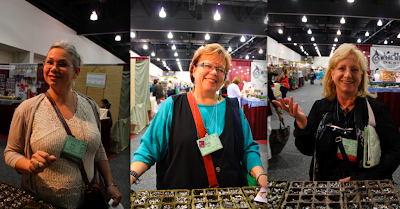 And last, but certainly not least are two lovely ladies that work mostly for Interweave! Michelle Mach and Jean Campbell! They are both really funny and intelligent and I could pick their brains about the beading world for hours. I'm glad that I was able to see them and everyone else today! I'm pretty worn out, but I wanted to post pictures I took at the show if I could. It was fun to see all the people that came by. I always feel as though the big shows, particularly Bead&Button, are kind of like summer camp (or at least what I imagine summer camp would be like). Everyone is all happy and crafty and away from home. Heather Wynn Millican and her son, Henry. She and her mother make lovely polymer clay pieces. I wear a cuff bracelet with a quote on it that Heather made every day! 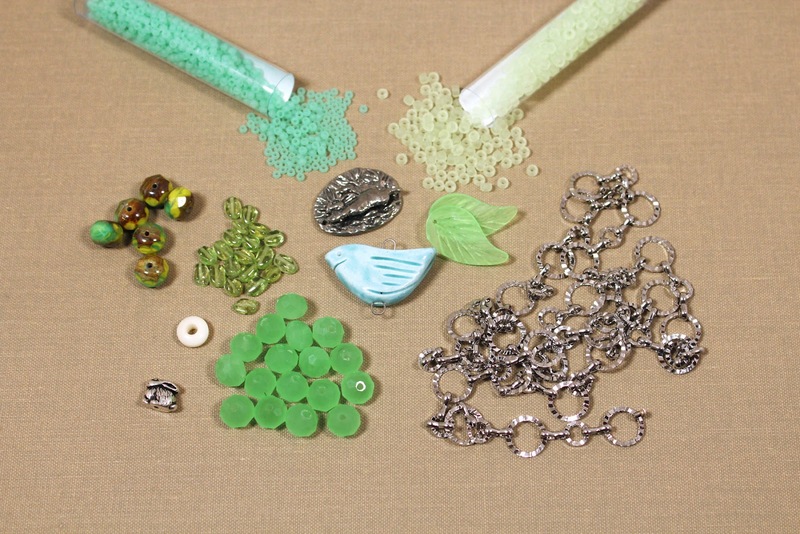 Another delightful polymer clay bead maker, Heather Powers of HumbleBeads. Heather recently came out with a great new book and is planning all kinds of fun retreats! PA, represents! (Well, Philadelphia area PA, in any event!) 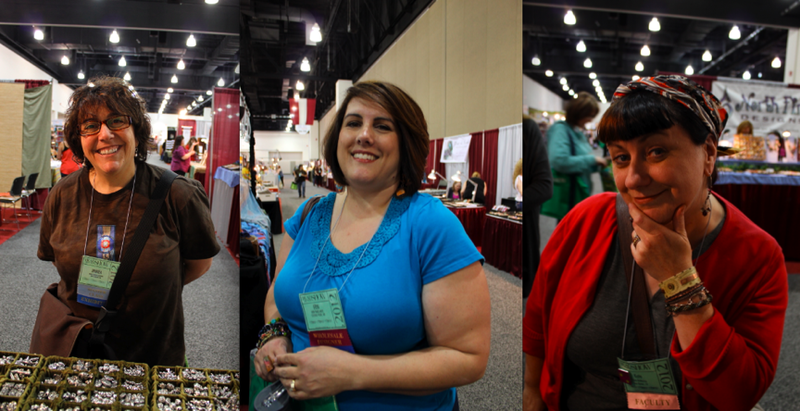 Here's Karen Keegan, Denise Peck, and Leslie Rogalski. Karen is busily getting ready for BeadFest in August. Denise is planning the next wire issue and Leslie is always a whirlwind of creative plans! Andrea isn't set up here this year, but she stopped by before taking off. 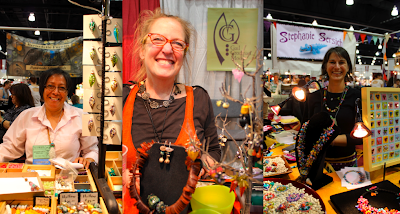 I always enjoy seeing her and love her lampwork beads. I briefly saw Erin Prais-Hintz sporting a new haircut. Isn't it cute? She's darling. I can't wait to catch up with her more over the course of the weekend! Erin is having all kinds of challenges and inspirational motivation on her blog! And we can't forget Kate Richbourg! She's due to come out with a book from Interweave soon! I'm very excited! Always lovely, Julie Young from Tierra Cast stopped by. 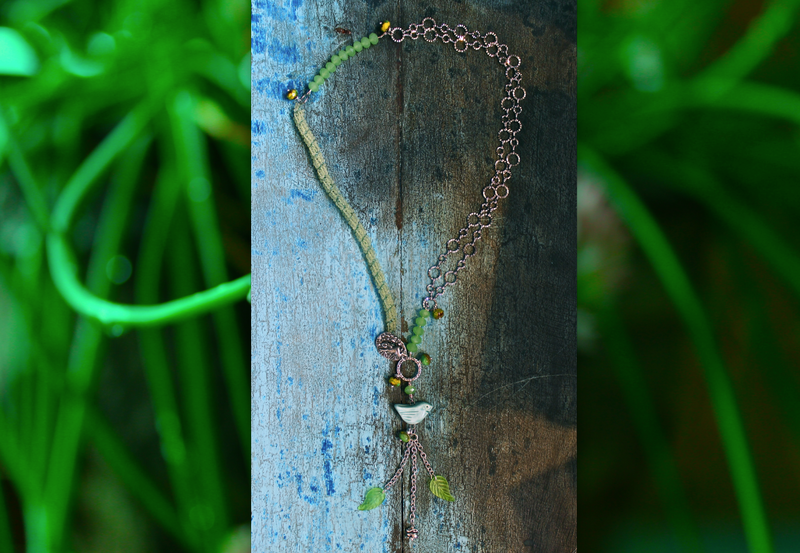 On her necklace she's got the new pinch-bails AND a one-of-a-kind Bob Burkett bead. 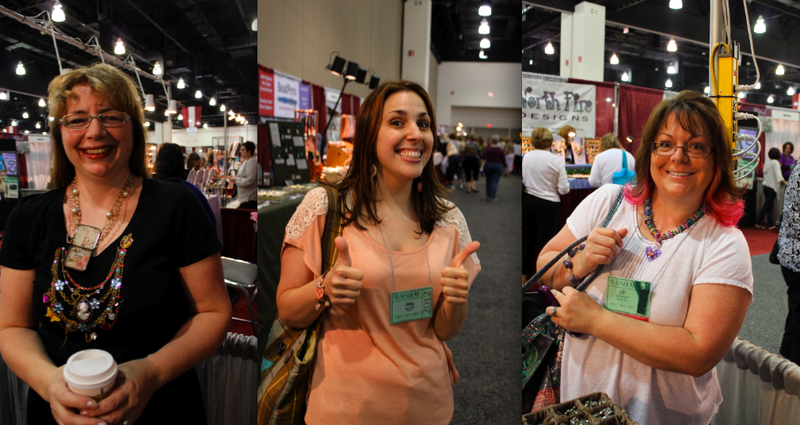 The new president of the Great Lakes Bead Guild, Sharon popped by from YaDahSi Beads. She told me that the name meant "yes" in three different languages. 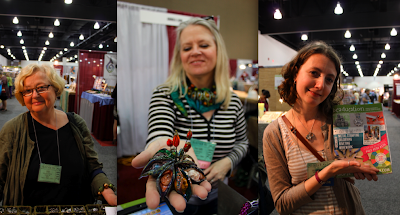 And Julia, the new editor of Bead&Button magazine came by and was showing the shrink-plastic piece that my niece, Azalea, made for the show. We just got back from Port Townsend, teaching at ArtFest, where we were set up next to the charming Melissa Manley. She has been making some pretty awesome enameled pieces lately. 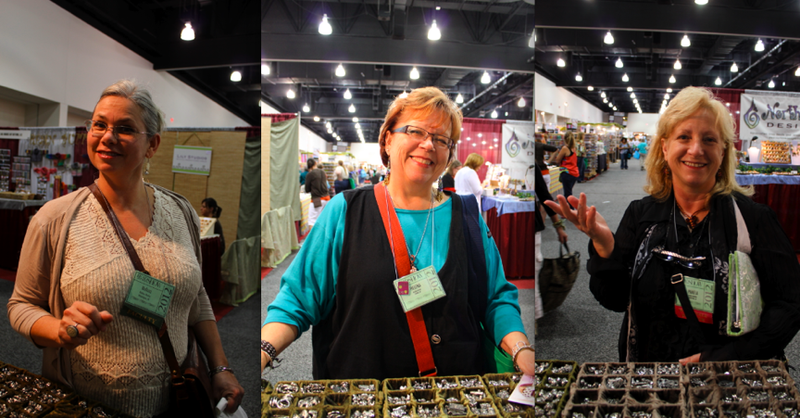 Helena from the Great Lakes Bead Guild swung by to remind us about the show in October. She's great! 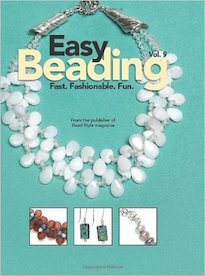 And last but not least in this update is Pamela Hawkins from the new Bead Design Studio Magazine. As I was leaving for the airport, I snapped this picture of Paulo and Babette! Here they are perched on top of the freezer next to the front door. They wore sad little expressions on their sweet faces that said, "STAY!" I miss them already and don't know how I'll get a wink of sleep without them. We recently had an appraiser come in and look at the house; the owners of the property wanted to refinance. Before he came, I heard frightening stories about how they'd go around with tape measures and would measure even the closest space. I imagined someone with white gloves and a laser pointer. If you remember the Messy Workshop Blog Hop, then you know that my studio needed some major TLC. I didn't want the refinancing not to go through because I needed to clean my creative room. So I ended up sweeping piles of stuff into boxes. Thusly, I ended up with a jumble of beads and components. And the more I looked at it, the more I just didn't want to deal with it. There's pretty awesome stuff mixed in... I just don't have the patience to sort through it all. Instead, I decided to post "Studio Floor Sweep" Mystery Grab Bags apart of the Destash Sale. I thought it'd be a nice way to pass along some of my treasures that I won't be utilizing. CLICK HERE to find out more and to get your own! Each bag is stuffed full and is different and unique and features a random selection of jewelry components. In a few hours, I'm heading off to Milwaukee for the Bead&Button Show. This is perhaps the first time in a long time when I didn't feel an overwhelming sense of pressure, fatigue, and disappointment. Generally before one of the big shows, I am rushing around at the eleventh hour trying to cram in as much as possible. I make myself crazy with big plans that I ultimately can't complete. I have a tendency to bite off more than I can chew and stay up the night before I'm supposed to leave trying to fit in as much as I can. This time though, the kiln was broken. So I couldn't squeeze in one more firing. We only have one car and have to share it, so I couldn't run out on one more errand. I'm flying out of a closer airport and while it will take eight hours to get there as opposed to one hour, I didn't have to schedule in an extra two hours to sit in traffic or force William to take a day off to shuttle me to Pittsburgh. I forgot my jewelry kit at the store and I can't fuss over those last minute designs. I accepted that I ran out of mailer envelopes and will just have to wait until after I get back before I can send things out. (Don't worry if you ordered something during the Destash Sale, I placed a U-Line order and they should be waiting for me when I get back and I will send out the orders as soon as I return.) Things that at first seemed like setbacks are actually responsible for this new acceptance. All the small things that add up to make me crazy seem to be just what they are... small. They seem like tiny little things in comparison to the big life events that are taking place. After over twenty years, I have a brother again. A huge pressure that has been squeezing at my heart has been released. And I can just sort of be. The obstacles that hurl themselves at me now are small and I can stride over them. I can stop and appreciate the flowers instead of fretting if I need to check a bag or not check a bag. I can stop and smile, happy to see my friends and family soon. I can stop and be, and not worry about the small things. Just down the block from Allegory Gallery there's an old-fashioned barber shop. It even has a Barber's Pole! As I mentioned yesterday, I really appreciate good signs and business markers. 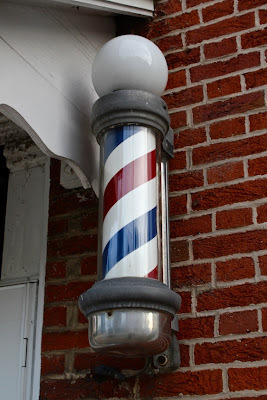 I love how iconic a barber's pole is! It does have a gruesome history though. Apparently barbers were also once the local surgeons and dentists (in the Middle Ages). The stripes on the pole signify bloody bandages, the globe is a euphemism for the bowl the leeches were kept in, and the pole itself is a symbol of the staff patients would cling to during painful surgeries! Eek! Sometimes I'm glad that many of these symbolisms are whitewashed and forgotten nowadays. It makes it easier to just appreciate the mechanical sign. When I started blogging, there wasn't even a name for it. This blog is the most recent incarnation and I am six and half years into it. People used to think that I was crazy for putting myself out there and for sharing my personal thoughts. I used to get sideways glances when I told people of my "web journal", as if I had some kind of exhibitionism fetish. Nowadays it is the most common of things to have a blog. There is a blog for almost every topic under the sun. Type in the most obscure thing and there is a surely a blog about it. The platform is conducive to connecting people and perhaps that's why I've done it so long. While I was talking with my brother, for the first time in over twenty years, one of the things he mentioned was our blogs. He said that he would check in on us from time to time and that it was one of the things that encouraged him to get back in contact with us. He read our blogs and felt connected to us. I felt my throat hitch. When you write a blog, it's sometimes kind of like shouting into the wind. You're surrounded by thousands of other voices and you don't know who will hear your message... if at all. Sometimes it's discouraging to put so much time and effort into a post and only see a handful of responses or none at all. Sometimes it's discouraging when you DO receive comments, but they are negative and nasty in nature. Sometimes it's discouraging when people take advantage of your willingness to share and use that information against you. But still... I've continued to type out my life, even when it seemed like the last thing I wanted to do. 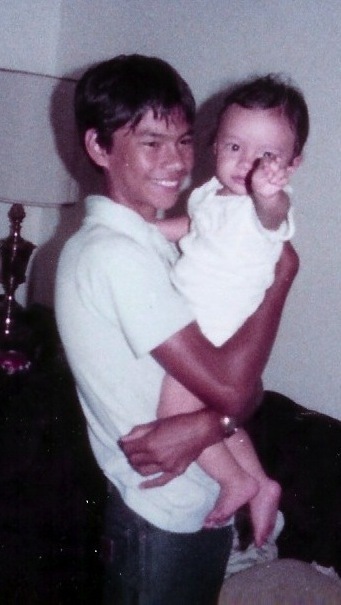 Part of the "secret agenda" of this blog was to reach out, across the miles and many years, and hopefully connect with my brother. It was my hope that my small voice in the sea of voices would find its mark. It is good to know that it did. This was the sky after the tornado touched down this past Friday. We were lucky not to be in the path of the storm. The photo was taken where we live. The sky was a mix of the most vibrant rose and gold. It made the wet grass and leafy woodland seem like most verdant emerald. This is a shot taken not far from where we live a few days after the storm. They were not so lucky. It used to be that you couldn't see this far back. The view was totally obscured. Now, trees with trunks the size of two of me were snapped in half. Branches and torn limbs scattered the ground. Clean-up is still in progress. Fortunately, no one was seriously hurt. It'll take time to repair the damages. To read more about the aftermath of the tornado CLICK HERE and HERE. 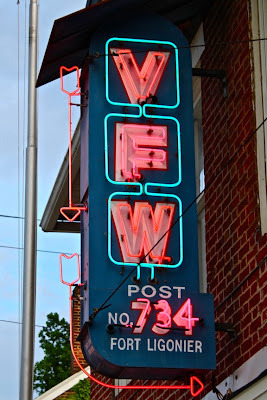 I really love old neon signs and vintage marquees. There's a real art form to creating eye-catching and appealing signage. We are lucky and the VFW a few doors down from Allegory Gallery is a fine example of neon artwork. The aqua and coral lights burn distinctively on the block. The credits were rolling and Florence and The Machine's "Breath of Life" filled the theater. William checked his messages and my brother-in-law, Greg, left a message that my brother had gotten in touch with my family. I sat there shocked, unable to form words. 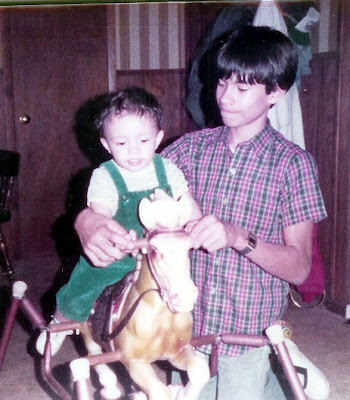 My brother, Dwayne, has been missing for 22 years. He left when I was still a child and until yesterday, we had not heard a single word from him. We didn't know if he was married or had kids. We didn't even know if he was alive or dead. Sometimes my mom would call in the middle of the night, crying and asking if I had seen my brother. Sometimes she was so convinced she had seen him at the grocery store or that the news clipping about a mysterious fallen solider was him. I pictured this moment a thousand times over the two decades. I used to think that we'd get a secret message or a mysterious envelope would appear with clues to his whereabouts. Sometimes when my sisters and I would be sitting around a table, we would imagine scenarios of his return. What I couldn't imagine was exactly how I would feel. The initial feeling was disbelief. Was it him? Was it really him? Or was it someone else who was just pretending to be him? Then there was anger. Why hadn't he contacted us? Why did he abandon us? Were we that bad? Then there was acceptance. Then there was happiness. Then there was fear. Would he leave again? Would he like the people who we've become? Would we get along? Would he want to stay in contact? What happened to make him reconnect after all this time? For an answer to a mystery – probably one of the biggest mysteries of my life – there were many, many, many questions. When I used to talk about my brother, I would do so offhandedly or with a little ironic laugh. Kind of like it was no big deal. Kind of like everyone had a sibling who was missing. Someone once said that it seemed like I had moved past it, like I didn't care. But this isn't something that you move past or not care about. It's something that becomes a part of the structure of who you are. At the core, there's an absence and a loss. You build around it, creating walls, layering it in scar tissue. You always wonder. You smile to cover the hurt. You laugh to muffle a cry. You don't "get over it"... you just "get by". I talked with my parents. I talked with my sister. But I didn't talk to him. I was still in shock. And then the phone rang today and it was him. We exchanged greetings after twenty years of not a single word. His voice was like my own, but different. I could hear in it my father. I could hear in it my grandfather. I felt nervous and anxious... but curiosity kept me on the line. As unsettled as I felt, I also felt strangely at ease. Kind of like going back to a familiar place. We talked for a few hours. We talked until the phone pressed against my ear hurt. I asked questions I had asked myself a thousand times, but never got any answers to. This time there was a person with answers; this time there was a person who knew all the answers to the questions I wanted to hear, my brother. Last week, my brother-in-law got married. I mentioned the happy couple on my blog HERE. In that post, I also said that I had been busy creating jewelry for the bridal party and the immediate family. I received a couple of emails asking to see pictures of the jewelry. I didn't get a chance to take any pictures of the bridal party jewelry (peacock feather earrings, peacock feather pendant necklaces and simple bracelets made of Swarovski crystals in teals and black) or the pearl necklaces I made, but I did take a few pictures of the necklace for my mother-in-law. Becki asked me a few months ago to create this piece. She said she was wearing a dress with a lower neckline and that she wasn't afraid of a little bling. So, I went to work! I wanted to create something special for her since she's such a special lady! I wanted to make her something simply dazzling. 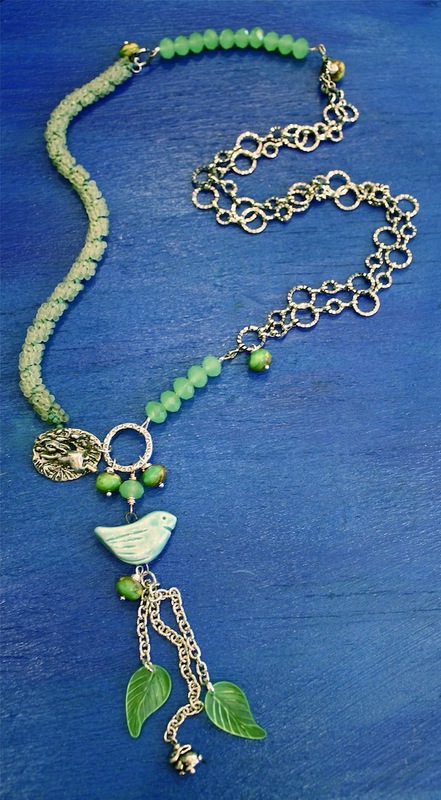 The necklace is thickly clustered with wire-wrapped Swarovski crystals and Czech glass in peacock colors; there are several hundred wire-wraps. In the light, it glitters and sends off dozens upon dozens of little, sparkly points of light. It weighs a fair amount, but it's worth its weight in compliments. All throughout the reception, I heard people commenting on the piece. Even while I was working on it at the store, I received many compliments while it was still in progress. 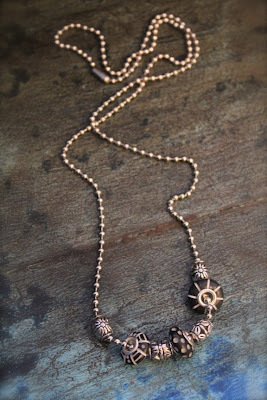 I made a similar style bracelet HERE, but this necklace took the idea to new levels! I feel happy that I was able to make something to show how much I appreciate Becki being in our lives. She's a great lady! Toward the end of the day yesterday, the skies became a frothy dark mass and threatened to pour. A customer walked in just as I was about to close and we ended up chatting. A few minutes after she left, the ominous clouds broke and the heavy rains began to hammer down; the strong winds whipped ferociously! I decided to stay at the store while the worst of the weather passed. At the time, I thought I had rotten luck. As I made my way home, I came across several road blocks. It turns out that there was a tornado that touched down and it pulled down a bunch of power lines and trees. Had I left when I originally wanted to, I would have been directly in the path of the tornado! I feel blessed for the stranger who came in and delayed my leaving and possibly saved my life. It took an hour to get home, navigating the road blocks and winding my way through backwood roads. When I got home, I took a picture of my battered peonies... still studded with raindrops from the violent skies. As a member of the blog partnership I got this impressive package filled with chain from Fusion Beads. I had a great time working with it. I really wanted to highlight the chain and make it the star of the show. I dangled some Swarovski crystals with different bits of chain from French earwires. I love the movement in these. The crystals sparkle and create beautiful points of light along the neck. This is a pretty simple bracelet, but I like the chunky layers of the multiple lengths of chain. 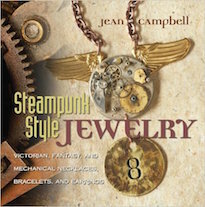 The bits of chain are attached to a sterling silver toggle with jump rings. I think the design is a little edgy. Kind of like a "biker bracelet". Depending on the toggle choice, the bracelet could be unisex. Ball chain is something that I both love and dislike. 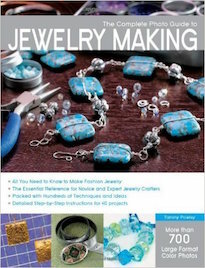 I love it for it's ease of use for creating necklaces. But the application of it is sometimes frustratingly limited. I decided to use the ball chain that they sent me by dressing it up with some large-holed beads. It's a simple design that can be added to upon whim or occasion. I was just smitten with the link chain. I thought they looked like bones. 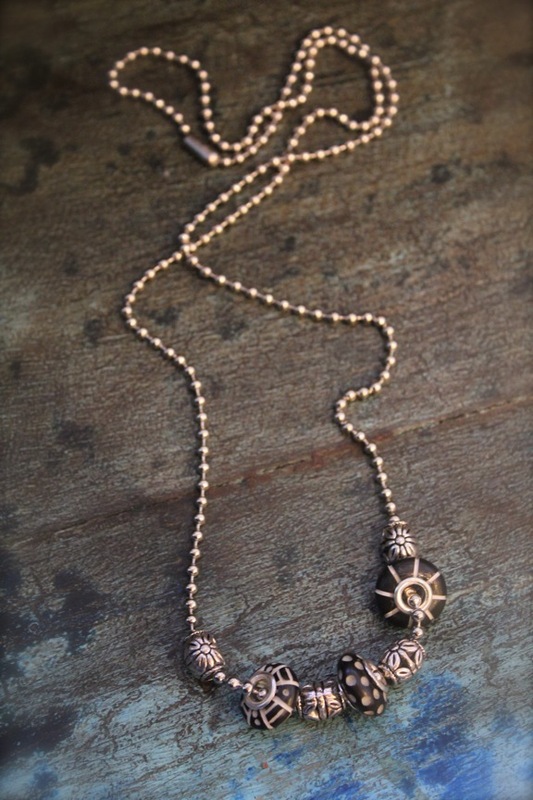 So I added a ceramic sugar skull pendant from Gaea and some lucite flower dangles. I think it makes a fun design. I decided to go for a second round with the ball chain. I wanted to do something "more" with it. I thought about the structure of the chain for awhile and decided to create almost like a Native American-inspired warrior bib-style necklace. I wire-wrapped elongated hairpipe bone beads. The pieces fit between the balls, creating an almost breast plate of bone beads. 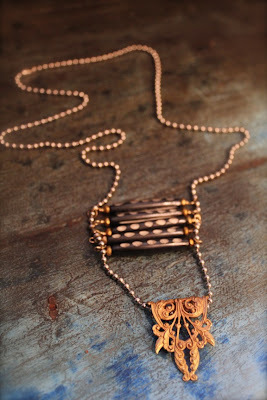 I needed some visual weight to anchor the piece and decided to use a piece of filigree. I like the shape and how it mixes the metals up a bit. I rolled the edge of the filigree to create a bail and strung the ball chain through the roll. The best part of working with the chain is that these designs came together relatively quickly. If you're in a pinch getting ready for a show or need to stock up on quick gifts, utilizing chain is a great way to bang out a lot of designs in short order. Definitely check out Fusion Beads for their great selection of chain! FTC Disclosure: The materials provided came courtesy of Fusion Beads free of charge. This blog post reflects my honest opinions and experiences using the complimentary product. Today is a special day! It's the Reveal for the Lima Beads Challenge. Each participant in the challenge got a kit from Lima Beads and put together a piece that showcased their talents and imagination. Each challenger could use as much or as little of the kit as they liked. The kit was a blend of beautiful greens and whimsical spring-themed components. It included a mix of seed beads, a toggle from Green Girl Studios, lucite leaves, chain, a tagua nut bead, Czech glass, a TierraCast bunny charm, and a ceramic piece from Melanie Brooks of Earthenwood Studio. Here's what I made! I wanted to use as much of the kit as I could. I used the seed beads to create a spiral stitch rope. I wanted to visually balance the beaded rope, so I doubled up the chain. 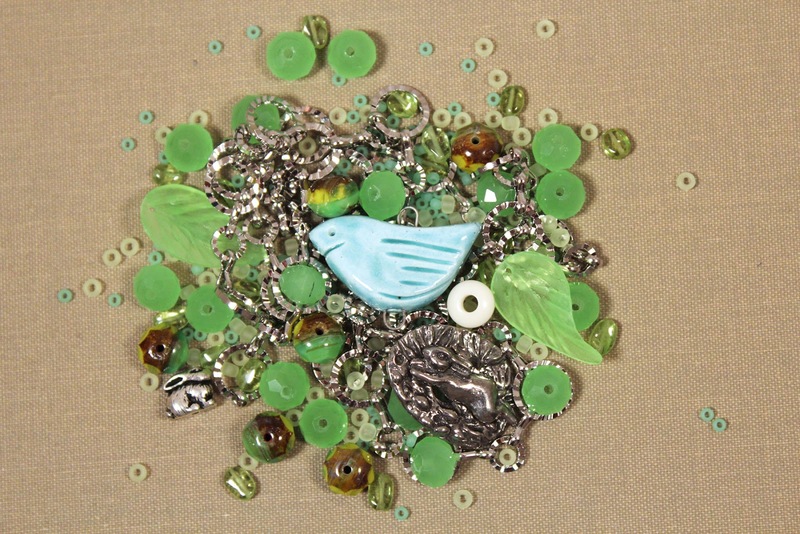 I used the bright green Czech glass to help move the eye around the piece. The toggle was so adorable, I had it front and center. 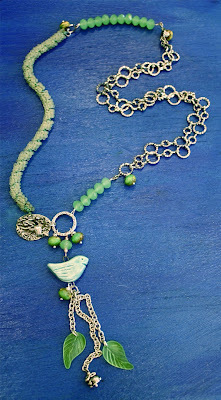 The focal had a cascade of chain from the ceramic bird – fringed with the leaves and the bunny charm. I'm quite satisfied with the way mine turned out. I just beginning my foray into seed beading and I was pleased with how I merged my "signature style" with the new techniques.